China To Let 2,000 Ethnic Kazakhs Relinquish Citizenship And Leave The Country The announcement, from Kazakhstan's Foreign Ministry, comes after reports of massive repression of ethnic Muslim minorities in far western China. 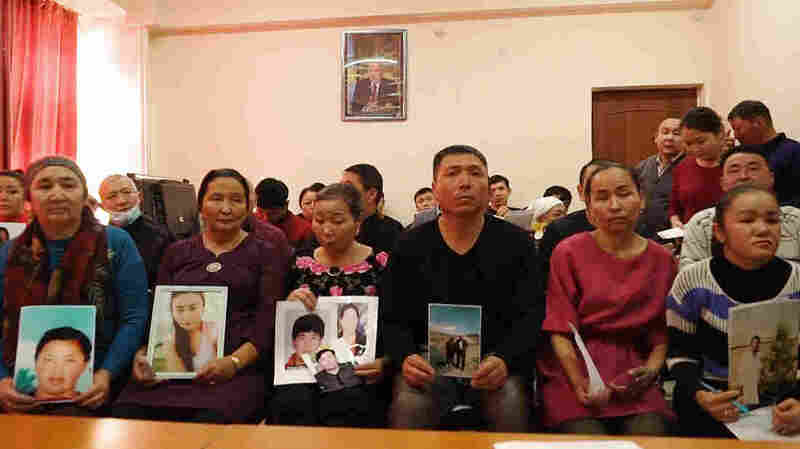 Relatives of people missing in China's western region of Xinjiang hold up photos of their family members at an office of a Chinese Kazakh advocacy organization in Almaty, Kazakhstan. China is letting more than 2,000 ethnic Kazakhs drop their Chinese citizenship and leave the country, according to Kazakhstan's Foreign Ministry. The Associated Press first reported Beijing's decision, which was later confirmed by the ministry. It's unclear who among the ethnic Kazakh community can leave China or under what circumstances. China's Ministry of Foreign Affairs did not immediately respond to NPR's request for comment. Kazakhstan allows ethnic Kazakhs, including Chinese citizens, to repatriate and gain citizenship, NPR's Rob Schmitz has reported. However, the Central Asian country has long been hesitant to confront its large neighbor on the treatment of ethnic Kazakhs because of its dependency on Chinese investments and loans. The change suggests that Beijing is under pressure following international condemnation of its crackdown on Muslims in northwestern China. Kazakhstan is also an important part of Beijing's One Belt, One Road trade initiative. Xinjiang, an autonomous territory in China's west, has gained the reputation of being one of the world's most fiercely controlled police states, with security cameras ubiquitous on street corners and even in dwellings. The region is home to ethnic Kazakhs and ethnic Uighurs, both mainly Muslim minorities who make up less than 1 percent of China's population. Under President Xi Jinping, the government has rounded up hundreds of thousands of ethic Kazakhs and Uighurs for so-called re-education camps. Inmates have described them as "political indoctrination camps," with cramped spaces, scarce food, torture and disappearances. One detainee was a prominent, ethnic Kazakh artist, according to Radio Free Asia. "She was sent to a political study concentration camp in April 2018, and I heard she was sentenced to three years, with no reason given whatsoever," said Serikjan Bilash, the head of Kazakh human rights organization Atazhurt. "She has become seriously ill inside the political study concentration camp, and people say she has lost touch with reality." Schmitz reported on an ethnic Kazakh woman who left China but had to return to complete the paperwork to cancel her citizenship. Authorities there forced her to have an abortion and took her brother to an internment camp. She was monitored by officials in her home for two months. "They probably wanted to send me to a re-education camp," she said, "but because they knew that forcing me to abort my child was illegal, they didn't want to make things worse, so they chose to detain me this way." Satellite images and official documents indicate a complex system of forced labor at factories inside and near the detention camps. Last year, the Congressional-Executive Commission on China led by Sen. Marco Rubio, R-Fla., and Rep. Chris Smith, R-N.J., called the situation "the largest mass incarceration of a minority population in the world today." The Senators also denounced "the escalating crackdown against Christians in China" which they said was "set against the backdrop of the human rights crisis unfolding in the Xinjiang Uyghur Autonomous Region."